You’ll spend more than 150 hours and make over 2,000 decisions when it comes to planning your wedding. 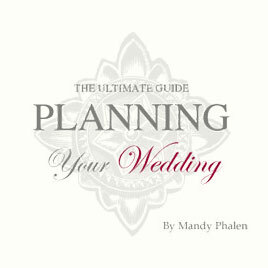 The valuable advice and many worksheets for charting your progress in the Planning Your Wedding guide will help you through each stage of preparation, right up to your wedding day. The 52-page guide is divided into two sections. The first section is an overview of the different elements in a wedding. The last section includes things to consider and questions to ask while you are meeting with the various vendors youâ€™ll need. Available as an Adobe PDF file or on a CD and mailed to you. The PDF is priced at $24.95 and the CD is priced at $29.95. Purchase the guide in PDF format via PayPal for $24.95. Purchase the guide in CD format via PayPal for $29.95.